In 2005, things were looking good out in the western suburbs of Copenhagen. Brøndby had just won the double with legend Michael Laudrup at the helm, European football beckoned, and the club looked poised to embark on a new period of dominance in Danish football. But it never happened. Last year they finished ninth, their worst season in 30 years, and this year they’re once again struggling, drifting in and out of the relegation places, currently sitting in tenth, equal on points but ahead of last-placed Silkeborg by virtue of a better goal difference. The threat of relegation beckons, but while it might sound like the bottom, it isn’t. Simply put, Brøndby may never win anything again. Sounds implausible? Not if you don’t exist. So what’s happened? How could a club with such esteemed traditions, not to mention the country’s best talent-producing system and fan base, slip to the brink of oblivion? Over a ten-year period in the 1980s and 90s, Brøndby enjoyed success unprecedented for a Danish club in European football. In 1987, they narrowly lost 1-2 on aggregate in the last eight to eventual European Cup winners FC Porto, and in the 1997 UEFA Cup, they lost at the same stage by the same score-line to Spanish outfit Tenerife. Their biggest accomplishment, the greatest of any Danish team at club level, came in 1991 when the boys from Vestegnen came within two minutes of reaching the UEFA Cup Final. Drawing 1-1 away at Italian giants AS Roma with two minutes to go of the second leg, having drawn the first game 0-0 in Copenhagen, Brøndby were looking set to qualify for the final on away goals. But in the 88th minute, a young Peter Schmiechel spilled a driven shot that allowed German curly-haired legend Rudi Völler to break Brøndby’s hearts. In fact, between 1990 and 2003, Bayern Munich, Schalke 04, Liverpool, Eintracht Frankfurt, Bayern Leverkusen and Torpedo Moscow all fell to the yellow and blues. And in the eleven-year period between 1995 and 2006, Brøndby won the Superliga five times and finished second six times. But since those glorious days, they have got nowhere near to adding to that tally. The trouble began in earnest back in 2005 when one of the leading investors, Torben Røsler, left the club due to disagreements with Per Bjerregaard the on-and-off executive director and chairman from 1973 until 2012 over the club’s business model. Since then things have only got worse. Much worse. The club’s finances have been embroiled in a downward spiral that culminated in 2012 when the club announced it was teetering on the brink of insolvency. Bjerregaard, the man who had been so instrumental in building up the club since its establishment in 1964, withdrew from the club in July 2012 after months of sustained pressure. Before then, a long list of potential investors had been put off by Bjerregaard’s insistence he would not release the reins of power. And it was also a difficult place to work: between 2009 and 2010, the club bid farewell to three administrative directors. All the while, as Brøndby hurtled towards financial ruin, potential saviours were now very rare indeed. Instead of relying on their much-heralded young development programme − which had served them so well over the years, producing some of Denmark’s best players: the Laudrup brothers, Peter Schmiechel and Daniel Agger, to mention a few − Brøndby made the dubious decision to enter an inflated transfer market to buy the players it thought were capable of recapturing past glories. Overrated and overpriced players like Jan Kristensen, Stefan Gislasson, Jon Jönsson, and Alexander Farnerud were brought in and paid monstrous salaries while failing to deliver the goods on the pitch. That in turn led to an exodus of starlets like Pierre-Emile Højbjerg, who became Bayern Munich’s youngest debutant ever last weekend, for little or no compensation. And it’s been no better on the coaching front. Since Laudrup left in 2006, Brøndby has had no less than five different coaches. René Muelensteen the Dutchman was signed as Laudrup’s successor, but he lasted less than six months before resigning, and those following − Tom Køhlert, Kent Nielsen, Henrik Jensen and current coach Auri Skaubelius − have been unable to drag Brøndby out of the quagmire. John ‘Faxe’ Jensen, the former international and Brøndby legend, who returned to his former club as part of the coaching team in October 2012, said that the demise of Brøndby has hit the club hard. Meanwhile, a series of recent incidents – including the holiday money scandal and a series of pitch invasions by the club’s fans that led to a few home games being played behind closed doors, and therefore no gate income – has meant that the club has been haemorrhaging money that it couldn’t afford to lose. The current situation is sufficiently dire that the club needs at least 60 million kroner by May 1 – no small sum even by today’s football standards – and Brøndby’s share price is at its lowest value ever. Numerous former players and prominent fans have pledged their support to the sinking Brøndby ship, and there is still hope that the club will survive thanks to its considerable loyal and dedicated fan base. But there might just be a flicker of light ahead in the tunnel for the blue and yellows, at least from a sporting point of view. They have begun picking up points in the league and, with three wins in the past six games, they look poised to stave off relegation for the time being. They even have a decent chance of some silverware and a return to European football thanks to a good run in the Danish Cup. They take on Esbjerg in the second leg of the semi-final on Thursday evening after a 1-1 draw in the first leg in Brøndby. 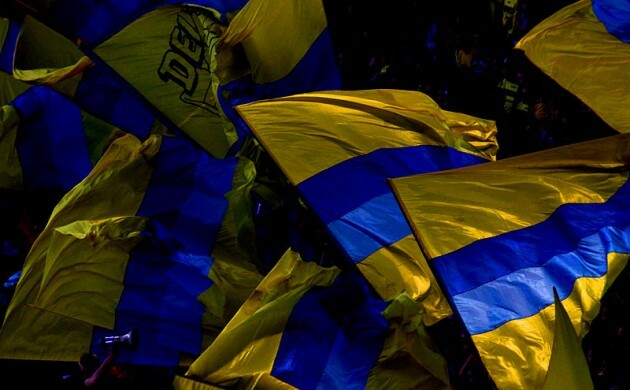 But while silverware, a dedicated fan base and a well-oiled talent production machine may generate hope for the languishing club, Brøndby’s future ultimately rests within its boardroom and the critical decisions that it makes. And as things currently stand, the future still looks rather bleak.